Like all the 3I Series of waterproof, hardshell cases, the SKB 3i-2011 is an ideal solution for storing and transporting your delicate electronics, A/V equipment, microphones, mixers, cables, computers, or percussion and music accessories. The rolling SKB case includes a cubed foam interior for even better protection for your gear. 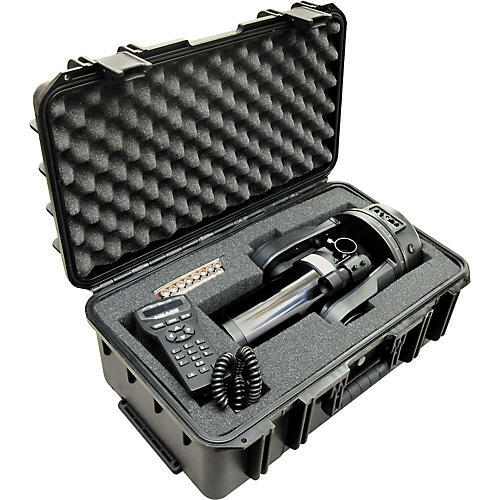 The SKB 3i-2011 injection molded waterproof case is constructed of ultra high-strength polypropylene copolymer resin and feature a gasketed, waterproof and airtight, submersible design (IP67) that is resistant to corrosion and impact damage. Its continuous molded-in hinge, patent-pending "trigger release" latch system, comfortable, snap-down rubber over-molded cushion grip handle, secure stacking, and automatic ambient pressure equalization valve (MIL-STD-648C) all contribute to its military-grade design. Its built-in wheels make it easier to transport your equipment.